Christmas was a special time at Fleischer Studios... 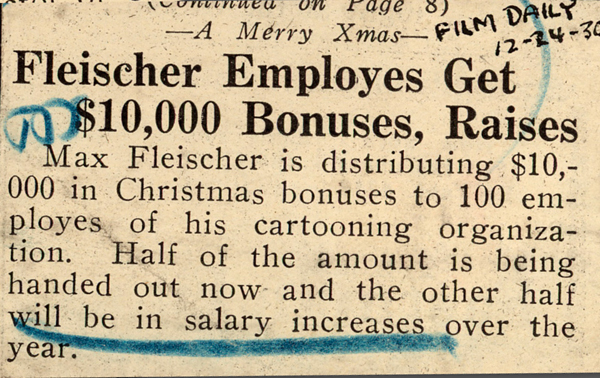 There were Christmas cards made by Fleischer Studios artists to exchange with each other... there was a huge party... and there was sometimes even a salary 'bonus.' We've put together some glimpses of how those zany Fleischer animators celebrated Christmas in the 1930's. All items in this Christmas exhibit are part of the Fleischer Studios Family Collection. At Christmas it was a tradition for Fleischer staff to exchange these cards with each other. These mini works of art were drawn and often hand-colored by the animators themselves. They featured studio stars like Betty Boop or Popeye, photos of spouses and children— or sometimes they’re just a gag about Christmas! The many marriages that happened between Fleischer staffers are reflected in some of these cards. Most of the Christmas cards here were drawn by men. In the early 1930’s there were no women animators at any of the studios. Women were only hired to do other jobs, such as painting and coloring cels. In 1933, Fleischer Studios was the first animation studio to hire a female animator! This card is from Max and Dave Fleischer, the brothers and pioneers in early film, who eventually formed Fleischer Studios. Max was President and Dave was Vice-President. The Flipper Club was a social and athletic club for people in Dade County, Florida who were working in the production of animated cartoons. This meant Fleischer Studios, since they were the only such studio operating there at that time. Beginning in 1939, to go along with the Christmas Party, the Flipper Club printed a booklet that served as a menu and program of events. The name Flipper probably came from the animators need to flip through their drawings to see the action when animating. Only three issues were created: 1939, 1940, 1941. Shown here are selections from those three issues. 1939 Flipper Shown on the left is the cover of the first Flipper for the first annual Flipper Club dance Friday, December 15, 1939. Prior to this, the Christmas parties were held by Fleischer Studios. This extremely rare film, never shown before, shows the Fleischer Studios Christmas party of December 1935. It’s blurry, and jumps around… but it’s amazing this bit of film still exists. The Studio had a BIG Christmas party for the whole staff every year. These were usually held in a theater or hotel, and they were big affairs! There was dancing, eating, crazy gifts, skits by staff, and a rousing good time. The parties grew bigger every year. While Fleischer Studios had nearly 100 employees in 1930—by 1939, after they relocated to Florida, their staff had grown to over 700. “In 1931, despite the depression around us, Max had a very successful year. It was so good that he decided to give a Christmas bonus of five hundred dollars to each animator. In addition he threw a party at the Hotel Wellington that was long remembered by the hotel’s staff.